Mention tribute-acts in front of most music-fans (including our Stewart) and they'll fix you a cocktail of shrugs and derision. But with Zappa Plays Zappa, you get precisely what a tribute-band should deliver - a family-member carrying on the legacy of his father's enormous contribution to rock and roll, as well as his own separately issued solo-works. To extend the band's concept a little, (Dweezil) Zappa Plays (Frank) Zappa is pretty much it. Obssessed over, misunderstood, loved and ignored in equal measure, Frank was more than a great guitarist - he could pretty much turn his hand to any genre, including jazz-rock, classical and avant-garde, adding sharp-witted observations ("Don't Eat The Yellow Snow") and humour ("Valley Girl", "Who Are the Brain Police?" and album-titles like "Sheik Yerbouti" and "Weasels Ripped My Flesh"). With such a vast catalogue to choose from, Dweezil's setlist must read like 'War & Peace' or 'Lord of the Rings' - there are a LOT of tunes in Frank's canon. His greatest works differ from fan to fan, opinion to opinion, but "Hot Rats", "Weasels..." and "Chunga's Revenge" rank highly, "Sheik..." and "Joe's Garage" are worth investigating" and "Guitar", a soloists' dream from 1988, rounds up some key live performances from the early '80s. You may or may not hear excerpts from some or none of these albums during a Zappa Plays Zappa show but with Dweezil, himself an established and technical rock-guitarist bar-none, you get the full, cheekily-titled, Tour De Frank. 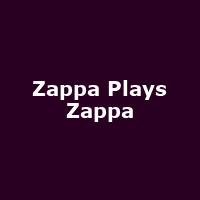 After performing various North American shows during the summer, Zappa Plays Zappa will once again hit the UK for a handful of shows in the autumn, starting with London's Roundhouse on 10th November, Brighton on 11th November, then Nottingham, Cardiff, Gateshead, Edinburgh, Birkenhead (very rare show) and Birmingham. All venues will be of concert-hall standard and tickets are available from us, priced between £29.50 and £32.50.